President Moon Jae-in’s role as a mediator between North Korea and the US is once again gaining attention as recent developments cast doubt over the denuclearization process. On Friday, US President Donald Trump canceled Secretary of State Mike Pompeo’s trip to North Korea, only a day after Pompeo’s travel plans were announced. Even before Pompeo’s trip was officially confirmed, speculation had arisen that his fourth trip to Pyongyang would bring about positive results concerning the denuclearization talks. Seoul had hung significant hopes on Pompeo’s planned visit, even postponing setting a date for the inter-Korean summit. When the two sides announced that a third summit between Moon and North Korean leader Kim Jong-un would take place in Pyongyang in September, the date was left open. The move prompted speculation that Pyongyang had agreed to a critical step, such as providing the US with a list of its nuclear facilities. However, the latest developments indicate that dramatic progress is unlikely. In the days leading up to the cancellation of Pompeo’s visit, international organizations reported that the North had not halted its nuclear program and had discontinued the process of dismantling a missile launch site. Cheong Wa Dae, which has until now maintained an unusually optimistic outlook on North Korean issues, appears to be admitting that the situation has hit a roadblock. Cheong Wa Dae spokesman Kim Eui-kyeom said Sunday that there was now an even stronger need for a mediator to break through the impasse and to facilitate greater understanding between the North and the US. He added that he expected Moon to play a bigger role in easing tensions between Pyongyang and Washington. With dealings between the US and North Korea hanging in the air, there is speculation that Seoul may seek to set a date for the Pyongyang summit as soon as possible. 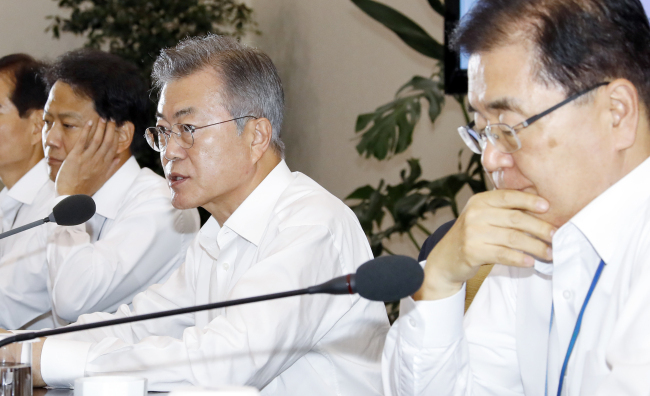 At Sunday’s briefing, Kim Eui-kyeom said that Moon and the North Korean leader were committed to keeping the momentum for the denuclearization talks going, and that the planned summit was conducive to that goal. While the Moon administration may still hold out hopes, faltering relations between Pyongyang and Washington have proved to be an unexpected variable in the plans for a joint liaison office in Kaesong. While Seoul denies that the liaison office violates any international sanctions, recent developments appear to have given Cheong Wa Dae pause. “Opening the liaison office was considered within the frame of Pompeo’s visit (and the) inter-Korean summit going smoothly, but as there was a new development, (the plans need) to be assessed again,” Kim Eui-kyeom said Monday. Kim also revealed that Seoul and Washington had been communicating on the topic. According to Kim, National Security Office chief Chung Eui-yong and US national security adviser John Bolton speak frequently, and Chung briefed Moon and concerned ministers on his most recent conversation on Sunday.